Forests and Pastures occupy 1/2 of the total surface of Albania. In 2106, about 80% of the forest fund was transferred to 61 Local Government Units as one of the major reforms developed in the recent years in Albania regarding the forestry sector. National Federation of Communal Forests and Pastures of Albania is a non-profit (nongovernmental) organization that represents the interests of about 600 thousand users of forests and pastures of Albania. They are individuals, families or group of families who take care about 30% of the forest land in Albania. National Federation of Communal Forests and Pastures of Albania brings together 11 Regional Federations of Communal Forests and Pastures and 260 Forests and Pastures Users Associations. It promotes the values of sustainable forests and pastures management as well as recognition of the use/ownership rights. We are member of International Land Coalition (ILC) and Regional Centre for Forestry and Rural Development (REFORD). National Federation of Communal Forests and Pastures of Albania has an ongoing collaboration with the Association of Private Forest Owners of Kosovo. The product of this collaboration is the newsletter “Green Crown” in which is reflected each month the common experiences related to private and communal forestry. NFCFPA mission is to address and convey the interests of its members to accelerate the decentralization, legalization of the ownership/user rights towards a sustainable management of forests and pastures. Recognizing and ensuring the rights of ownership and use, based on the best traditions of forest and pasture management by rural communities to prevent further degradation of natural resources, for forests and pasture regeneration, conservation of biodiversity and increasing income for rural communities. Organizing the trainings for safety measures, forestry farmer model, thinning, fire prevention, advocacy and lobbying, IPARD forest governance, financial management and self-assessment. Organization of activities related to gender issues (reflection on the current status of gender issues in forestry at regional and national level). The transfer of the management rights and responsibilities to the Local Government Units (LGUs) and further to the users (village and rural households) is the most important aspect of the reform in forests and pastures. Now the experience shows that the transfer of the responsibilities for the management of forests and pastures to the LGUs and further to the traditional users, based on the right and early customary tradition, is very profitable and successful, from which benefit rural families, which make half of the country’s population, and society as a whole. 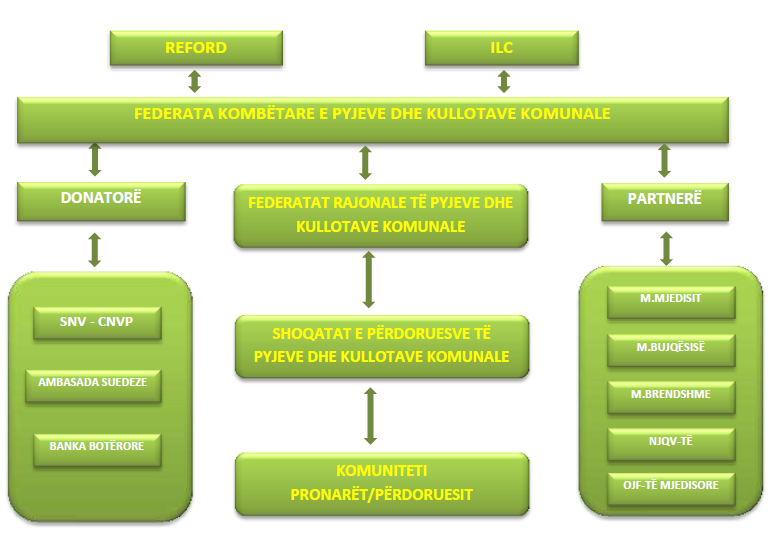 Partner associations: Association of Private Forest Owners of Kosovo, National Association of Private Forest Owners in Republic of Macedonia, Albanian Local Capacity Development Foundation.